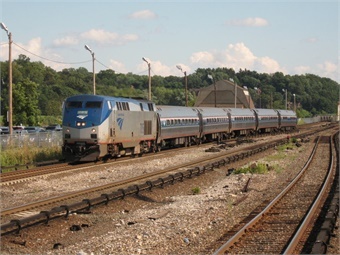 The U.S. Department of Transportation will provide $10 million to extend Amtrak’s Ethan Allen Express passenger train service all the way to Burlington, Vermont. Currently, the service begins in New York City and stops in Rutland, Vermont. The $10 million grant will fund approximately 11 miles of new rail track along the state-owned line and three passenger platforms in Middlebury, Vergennes and Burlington. The project will also reduce long-term maintenance costs for the state, allow passenger trains to operate up to 60 miles per hour and enhance safety at multiple railroad crossings. The project is one of 39 federally-funded transportation projects in 34 states selected to receive a total of nearly $500 million under the Department’s Transportation Investment Generating Economic Recovery (TIGER) 2015 program. Secretary Foxx announced project selections for this round of TIGER grants in October. The U.S. DOT received 627 eligible applications from 50 states and several U.S. territories, including tribal governments, requesting 20 times the $500 million available for the program, or $10.1 billion, for needed transportation projects. With this latest round of funding, TIGER continues to invest in transformative projects that will provide significant and measurable improvements over existing conditions. The awards recognize projects nationwide that will advance key transportation goals such as safety, innovation and opportunity. This grant is part of the seventh round of TIGER grants since 2009, bringing the total grant amount to more than $4.6 billion provided to 381 projects in all 50 states, the District of Columbia and Puerto Rico, including 134 projects supporting rural and tribal communities.